Our On Your Feet Girl's Embroidered Pearl Satin Ballerina Slippers by Isotoner are not only beautiful adorned with embroidery and pearl detailing they are also made of the same quality materials as our On Your Feet - Women's Embroidered Pearl Satin Ballerina Slippers. The stretch satin upper and foam cushioned suede leather sole surround your flower girl's little feet in the ultimate comfort of Isotoners quality materials. Great for weddings travel and home. Machine wash cold water with like colors. No bleach. Dry flat away from heat. Do not tumble dry iron or dry clean. Imported. NOTE: THIS PRODUCT RUNS A LITTLE SMALL. The length of the slipper in inches correlates as follows: XXSmall - five and three-quarter inches XSmall - six and one-quarter inches Small - seven inches Medium - seven and three-quarter inches Large - eight and one-half inches. This slipper does not come in an XLarge. 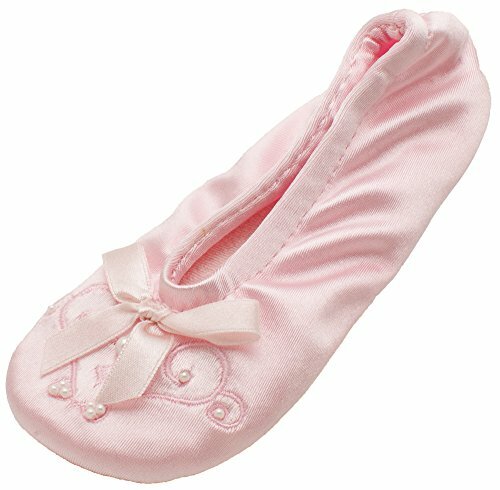 If you need a larger size we recommend our On Your Feet - Women's Embroidered Pearl Satin Ballerina Slippers in size Small The difference between the Child's-Large eight and one-half inches and Woman's-Small nine inches is one-half inch. Please contact us with any questions. These slippers make a great gift for the Christmas Winter Holiday Season.